"Thanks to the System of Alexey Alexeevich Kadochnikov I managed to survive"
I’m glad to see you on our Website, devoted to Kadochnikov System Russian martial art. It is also a private safeguarding technique and effective self-defense system – a skill that will help you not to be at a loss in extreme situation. The main goal of this Web-site is to provide you with all necessary information and practical knowledge about Russian Martial Art and Kadochnikov System in order that you’ll never be at a loss in any extreme situation. Probably, you have already tried to find a training mode that will help you to learn some special skills. Some people tried eastern martial arts, some – modern complex single combats, traditional boxing and wrestling. Probably, you have also tried to learn army hand-to-hand fight and other types of Russian martial arts. I think some of you have already tried several different types of martial arts in order to find “the secret” of effective fighting technique and private invulnerability. Yes, there are some secrets in hand-to-hand fighting. But there are not only tricks and ruses, which make an impression on the beginners; there is also a solid basis, which the training starts with. “Mind without intellect is a disaster” – said Suvorov. That’s why as long as you don’t understand the fundamental, core principles of martial art – how not to get a wind up when faced with an enemy or dangerous situation, how to protect yourself not only from punches and kicks but also from any kind of weapon, at the same time keeping your body and mind under control and adequately appraise the situation - there will be no use of any tricks and the most sophisticated fighting techniques. Do not rush only after the secrets of martial art. Study the martial art itself. On our website you can find really useful, applicable and valuable information in the form of articles, video lessons, books reviews and interviews on the real aspects of Russian Martial Art hand-to-hand fighting and private safeguarding technique. You will notice that on the right side there is a special form that requires name and e-mail. This is a reminder for you that you can get more valuable and important educational materials. When you subscribe to our newsletter “Kadochnikov System Russian Martial Art”, you’ll get the materials that have no free entrance to on the website. By means of these unique materials my trainees, followers and I uncover the most important, tested through practice and life knowledge about private safeguarding technique of a person in extreme situations as well as application aspects of hand-to-hand fighting for civilians and special units of security agencies. There are three reasons for you to subscribe. You will get access to the real, tried-and-true knowledge, which has shown its effectiveness and credibility many times. This knowledge will help you acquire necessary skills and abilities (thousands of people in dozens of countries use them as you do) will help you eventually not to be at a loss in any kind of extreme situation. You will get this knowledge regularly, month after month. This is the only way to get a video course and my special report. Some methods of elite special units training that you can also use in extreme situation. How to control your enemy without using rough physical force? Why do we use only 25% of one’s strength and how it can help us in the fight with the rival, who is much stronger and faster than you are? 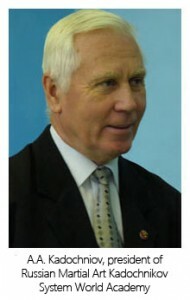 What is the main difference between Kadochnikov System Russian Martial Art and other combat sports? How to learn to find area of support and build leverages in order to control an enemy, as well as get knowledge about angles of “going into” the plane, “crank” in the contact point. Are you ready to subscribe? There is a special form below that you should fill in with your e-mail address and press the button. Important comment: at any time just by clicking you can cancel your subscription. 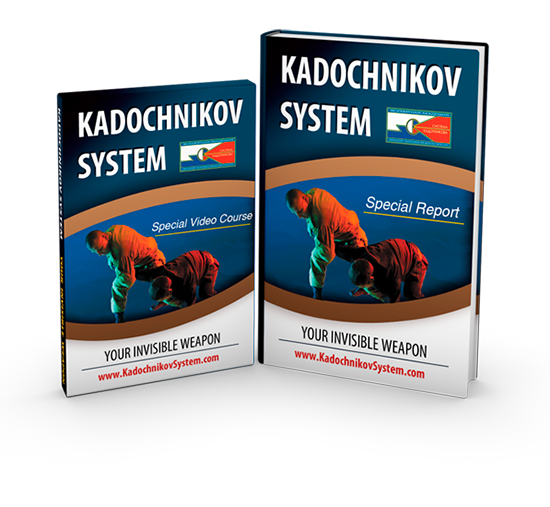 Enter Your Name And E-mail In The Form Below To Get A FREE Gift from Alexey Alexeevich - Special Video Course And Special Report "The Kadochnikov System: your invisible weapon"
Why do I present you so many valuable materials? There are three reasons. First, Kadochnikov Systema is my lifework. I have thousands of trainees in dozens of countries throughout the world. That’s why the magazine is the most accessible and the fastest way to provide people with new information, answer the questions by means of support services of the magazine and get new information from the trainees about their private stories and how the Systema helped them in different life situations. Second, I teach only the material that I know myself. I teach only the methods that my trainees and I tested thoroughly - only the effective ones. Because in a real extreme situation most of your illusions and guesses which have no real scientific ground (and which were not seriously tested) most likely will not work out. But to understand it you should open your mind. And our magazine will help you to take a first step towards it (to give up habitual stereotypes). Third, to start learning the Systema you should know who I am, what I teach and whether you can trust me or not. Today our Systema has different levels of training. You can order my video training courses and books, take part in our seminars and special educational training activities, do an individual training course and etc. But everything has its beginning. And my newsletter is the excellent opportunity to make our acquaintance. I wish you good health and strong will!